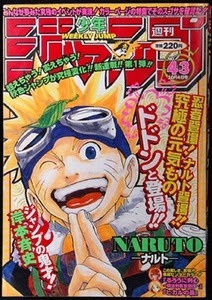 In 1997 Masashi Kishimoto submitted a one-shot titled Naruto, which was published in Akamaru Jump. After the failure of his first series, Karakuri, he was green-lit to publish Naruto as a series by Shueisha. The series premiered in 1999 Weekly Shonen Jump issue 43, and quickly became a hit. After a few years as a popular Jump series and an anime under its belt, Naruto, along with two other series (One Piece & Bleach) from the magazine were nicknamed "The Top 3"; due to the fact they dominated the ranks, tankōbon sales and fan base. The series had never risen higher. Now after 15 goods years of "Kage bunshin", "dattebayo", and Ichiraku ramen, an age of manga greatness is coming to a close. The story will end in Weekly Shonen Jump issue 50, officially out on 10th November 2014. The plot of Naruto is very long and at times complex. A in-depth summary of the series can be found here. In the beginning of the series Naruto, the story followed Naruto Uzumaki, a child ninja (shinobi) who constantly searched for recognition, with the dream to one day become the Hokage, the village leader and the strongest of all ninjas. However as the plot developed, Naruto faced many challenges. Dealing with his loneliness, the nine-tails which was sealed within him, and of course trying to rescuing a close friend (Sasuke Uchicha) from falling into darkness. At chapter 238, the series had a time-skip (time gap) and when the story continued in chapter 245, Naruto was no longer a child but a adolescent. The plot became more complex and tougher for Naruto, with the appearance of Akatsuki. Akatsuki was a group of criminals whose leader, Pain, wanted the tailed beasts, including the Naruto's nine-tails to control the world. However, after Pain's death it was discovered that the real mastermind behind Akatsuki was in fact a very powerful ninja by the name of Madara Uchiha. Eventually, a war broke out, where all the ninjas and their countries banned together to defeat Madara and his dark wishes. The situation during the war became dire, after it is found that Madara was in fact manipulated in order to revived an very powerful, almost godly like being named Kaguya. Through an encounter with the Sage of the Six Paths, Naruto with the help of Sasuke defeated Kaguya. The end of the war seemed near, until Sasuke proclaimed that he would cleanse and lead the world. But in order to do so he had to eliminate Naruto. So how will this hit series end? Lets look at the possible endings. 1. They is a possibility that both Naruto and Sasuke end up killing one another. What would happen to the shinobi world without either one of them? How will they be remembered? This ending would crush many fans. 2. One of them dies. Either Sasuke or Naruto. Will Naruto kill Sasuke? 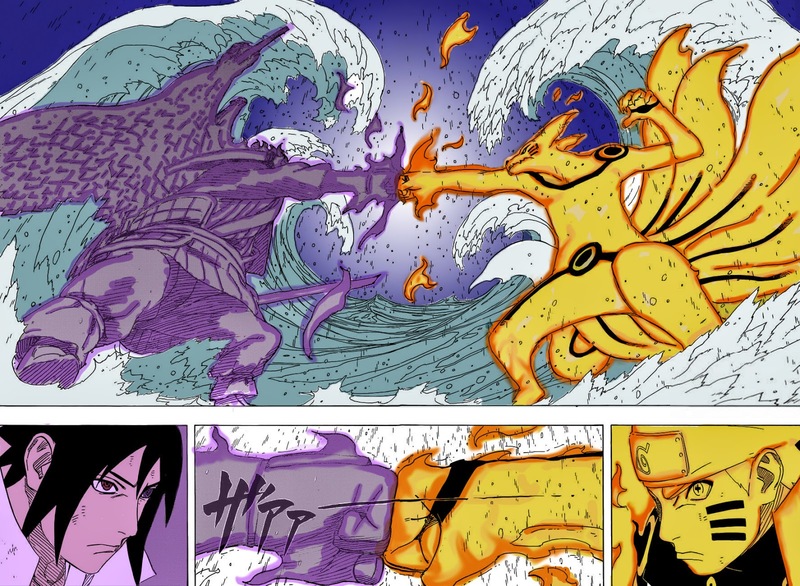 It does seem unlike, Naruto did mention that he would only defeat and not kill Sasuke. However Naruto might use excessive force and kill Sasuke. Another possibility is that Sasuke wants Naruto to win so that Naruto would be portrayed as the hero. As mentioned it does seem unlikely that Sasuke will die. However, Naruto's death is a real possibility. Sasuke could indeed kill him, or Naruto might sacrifice his life in order to defeat Sasuke and bring him to his senses. 3. Another real ending, is that both Naruto and Sasuke manage to live and both contribute to rebuilding and peace throughout the world. There have been scenes to support this possibility and the new Naruto movie is set in the future where they both survive. What do you think? How will it end? We just have to wait and see in Weekly Shonen Jump issue 50. "Naruto is heading toward its ending and hopefully I can conclude it on a really strong note. I'd love it if everyone could stick with it until the very end. And after that I might do something new, and I hope people will check that out as well. I plan to wrap up Naruto conclusively, so please look forward to it."